Maybe you’ve heard of this project going on called 93 Plates? No? Well, here’s a link explaining what it is 😉 Essentially, The Wandering Foodie has been eating his way around NYC – 3 meals a day, blogging about it, and inviting other food bloggers to join him. I’m currently sitting next to him in Starbucks, blogging our breakfast (if you can call it that… you know I am a savory foods kind of gal when it comes to breakfast! ), while he catches up in posts (it is NOT easy to blog concurrently with eating; that’s one of the reasons I tend to post about a month after I have eaten something). 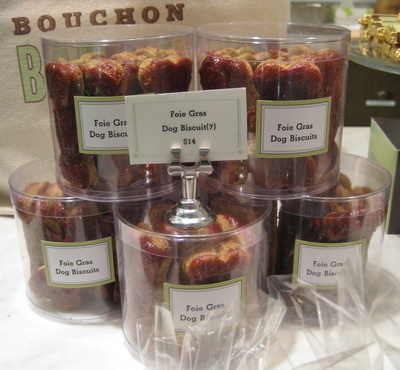 Here’s the other display case – doesn’t it look yummy? But enough pictures of stuff I didn’t eat. How about this? 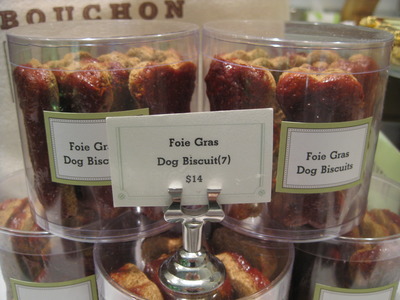 Some of you may recall that I went to Bouchon in Yountville, Napa Valley, a little over a year ago… and hated their TKO (Thomas Keller Oreo). Well, when I told Hagan that – who apparently LOVES Oreos! – he said we had to get it to compare. 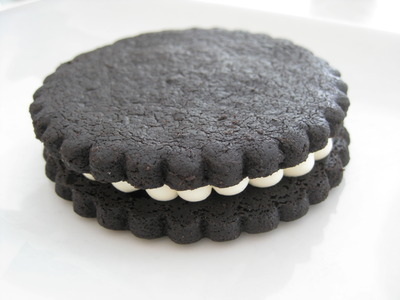 Now, my problem with the one in Napa Valley was that the cookie was hard/dry/too crumbly, and the cream was way too thick and sweet. If you compare the photographs, this one definitely already looks like less cream. Unfortunately, despite our informal-food-photo-shoot that lasted a good 15 minutes, I somehow managed to not snap a photo of the caramel macaron before we cut it in half. Durrr! But a macaron is a macaron is a macaron – the way it looks, anyway! – and this one looked no different (except being a soft brown in color). I have little to no experience eating macarons, so I will say: I was surprised by how crisp the exterior was, and delighted by the chewiness. It was, in a word, delicious. 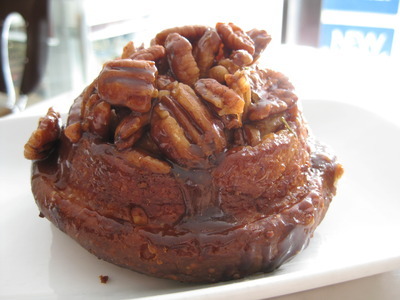 The caramel-cream-center was, well, creamy, and not too sweet. 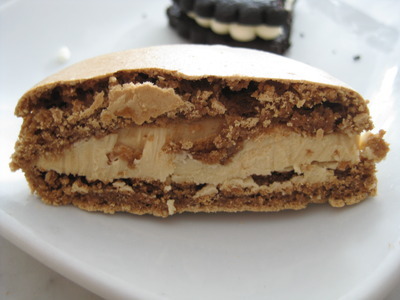 What could make this macaron better? -bear in mind, I have little experience with macarons. 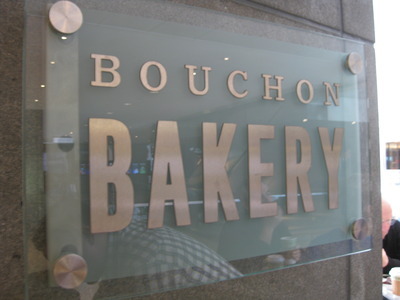 But the addition of sea salt might bring it to this whole other level that would bring me back to Bouchon at TWC day after day, week after week… considering the rest of the macaron is pretty awesome already. 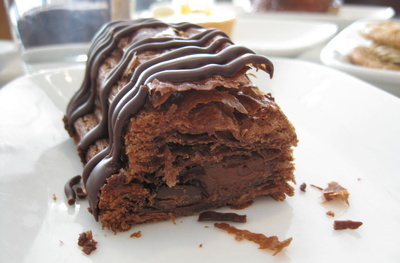 Pain au trois chocolat – just the name of it should send a shiver up your spine. If you’re a chocolate lover, that is. so here’s a better shot of the inside. LOOK AT THAT CHOCOLATE OOZING OUT. Is that not… almost… pornographic? Just a little bit, yeah? Unfortunately, I couldn’t eat more than a bite of this. I was flagging quickly… and it was way too sweet for my tastes. 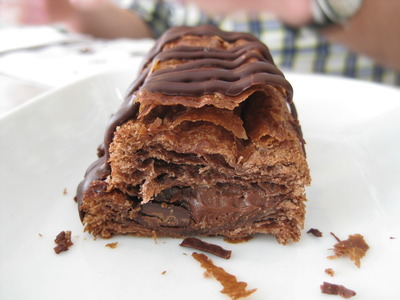 It was also super, super flaky, such that eating it was near impossible without getting some down my arm… on my lap… on the floor… on the table… everywhere. However, if you love chocolate – the sweet kind – you HAVE to get this. 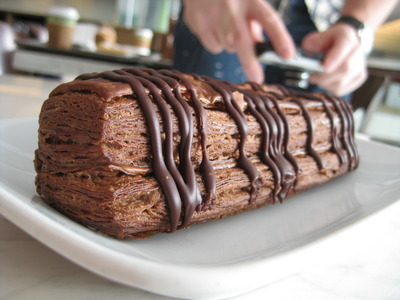 Ooshy chocolate, chocolate flakes of croissant, and a chocolate drizzle? Yeah. You do. 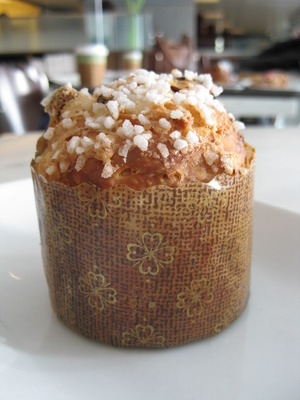 And here is the little chocolate bouchon. Small in stature, big in taste. No, seriously. 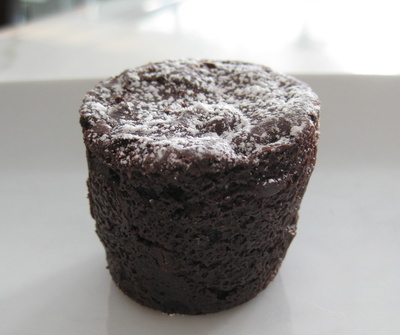 This lil brownie bites pack some serious chocolate in one dense bite: the first time I had them, a friend of my sister’s had made them for a party from the Bouchon cookbook. 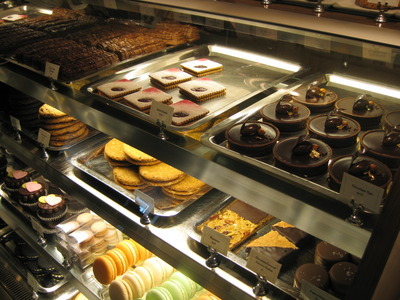 They were just amazing – she made them slightly less sweet than these, which I preferred – but the texture – super dense, chocolate taking over your senses – for a non-chocolate lover, I sure sound like one, don’t I? – but that’s what these little bites do to you. To me. I highly recommend these as well. 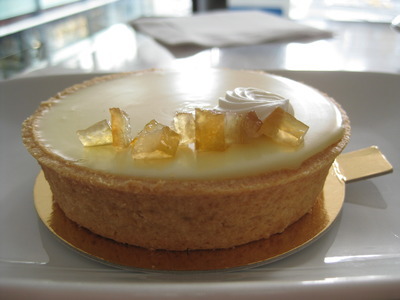 Lemon tart… the candied lemon (peel?) on top was a nice touch, and the lemon curd itself was nice and tart – a smidge of sugar, a great “palate cleanser” for between the other baked goodies we were enjoying. 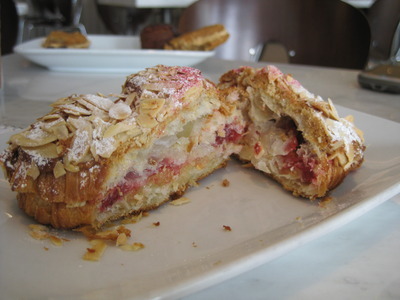 Raspberry almond croissant… just hearing the name, I wouldn’t order this, ever. I’m not big on raspberries. Cross-section. Wow. So, this item was not that sweet and was a total surprise. You’d think a croissant would be flaky and soft, but biting into it, the raspberry almond croissant was super crunchy on the outside, then the inside yielded to reveal a nice, slightly tart raspberry mixture. It was actually pretty amazing… I would say my favorite item of the morning (maybe the caramel macaron?). All the right textures, not too sweet, just a perfect harmony. 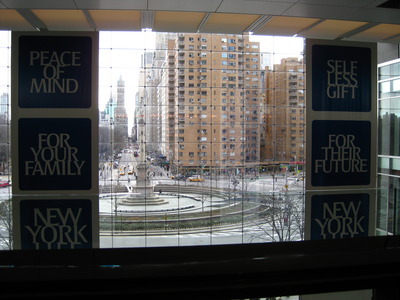 And this is the view from where we were sitting – straight out over Columbus Circle along Central Park South… a beautiful view, to be sure, and great light for an early morning breakfast. no wonder you were in a sugar coma yesterday. I want to try their food next time. And the Pain au trois chocolat looks good! i am eating lunch as i read this and Im glad I was having something sweet… because this post made me salivate and if not for the sweets in my lunch I might have crashed my diet! What an insanely delicious bunch of food! 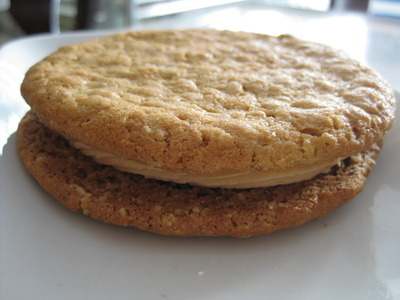 I loooove the peanut butter cookie. 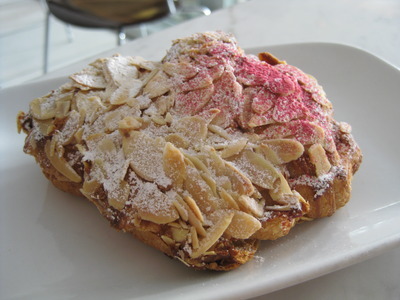 I will definitely have to try that raspberry-almond croissant–two of my favorite flavors together! The things we do for research, right?? 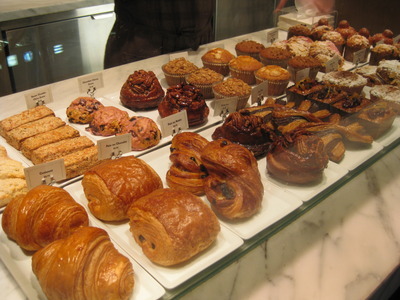 I’m having a sweet envy moment right now… I’m craving that raspberry almond croissant! I really hope the two of you actually finished all of these desserts! I totally would have, but I’m a bit more of a glutton than most people, I imagine.